A black and white photograph of the Whitby Centennial Building at 416 Centre Street South. This Greek Revival building was built in 1852-54 as Ontario County's first Courthouse. It was designed by noted Toronto Architects Frederic Cumberland and William Storm. The original building had a one-storey wing to each side of the centre portion. An addition was made to the north wing in 1866 and a second floor to both wings and an extension to the south wing was made in 1910. 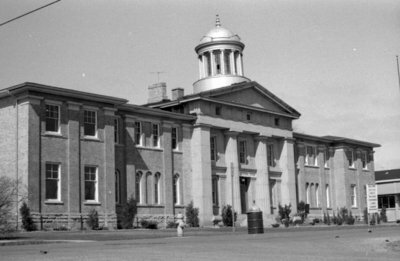 The Courthouse was replaced by a new building on Rossland Road East in September 1964, and at that time it was chosen as Whitby's Canada Centennial Project to be converted into a community centre. The Whitby Centennial Building was officially opened on February 18, 1967. A three million dollar renovation was completed in 2003 to mark the building's 150th anniversary. 416 Centre Street South, April 1976, Brian Winter. Whitby Archives A2013_004_016B.